Tour the southern end of the Blue Ridge Parkway if you ever get the chance. It's not far from Roan Mountain State Park and Elizabethton, Tennessee. If you like scenic drives then you'll love the Blue Ridge Parkway. Hubby and I added this onto our trip earlier this spring. I wish that we'd been able to squeeze more time away from the office. We picked up the southern end of the Blue Ridge Parkway in North Carolina. (This map details the full length of the parkway.) 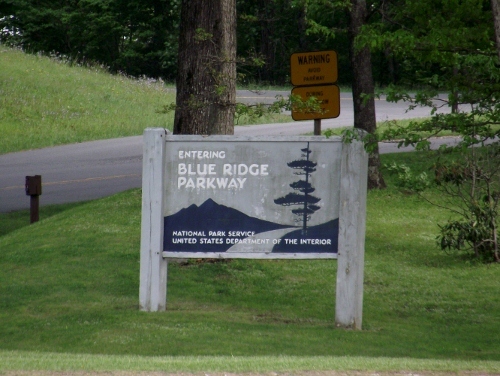 The Blue Ridge Parkway was built to connect Shenandoah National Park in Virginia with the Great Smoky Mountain National Park in Tennessee. The full route of the parkway takes visitors through some of the most stunning if remote parts of the southeastern Appalachians. There aren't many hotels or restaurants. We brought our own snacks and were very glad for them. As with food, gas isn't readily available on the Blue Ridge Parkway. We bought ours in one of the small towns that are just off of the parkway. While on the tour, we stopped by the NC Minerals Museum and drove past the Historic Orchard at Altapass. We stopped to take photos from several overlooks. It didn't take long to find a good place to have a picnic and walk around. I won't spoil the drive for you. Everything is stunning. If you want to know more about each point of the Blue Ridge Parkway at the North Carolina Experiences. It was beautiful in the spring. I can just imagine it when the fall foliage begins to turn the hills into deep shades of red and yellow. It compares favorably to Skyline Drive in Virginia, the Cherohala Skyway in Tennessee and North Carolina or the Tennessee Overhill. The Blue Ridge Parkway should be on everyone's list for a potential fall color driving tour. We had to make ourselves content with the southern end of the Blue Ridge Parkway. Next time, we'll prioritize it differently by making this our vacation instead of adding it onto our existing plans. It sure would be nice to visit when the fall colors are out. I'm going to see what we can do to make it happen.